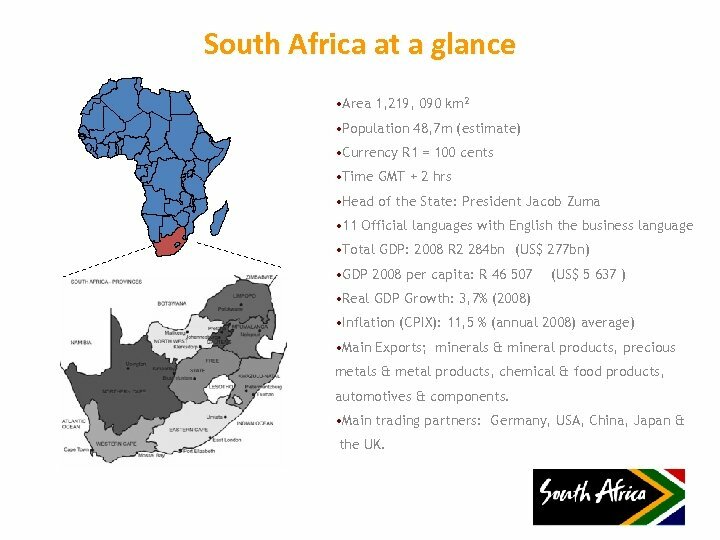 South Africa at a glance • Area 1, 219, 090 km 2 • Population 48, 7 m (estimate) • Currency R 1 = 100 cents • Time GMT + 2 hrs • Head of the State: President Jacob Zuma • 11 Official languages with English the business language • Total GDP: 2008 R 2 284 bn (US$ 277 bn) • GDP 2008 per capita: R 46 507 (US$ 5 637 ) • Real GDP Growth: 3, 7% (2008) • Inflation (CPIX): 11, 5 % (annual 2008) average) • Main Exports; minerals & mineral products, precious metals & metal products, chemical & food products, automotives & components. 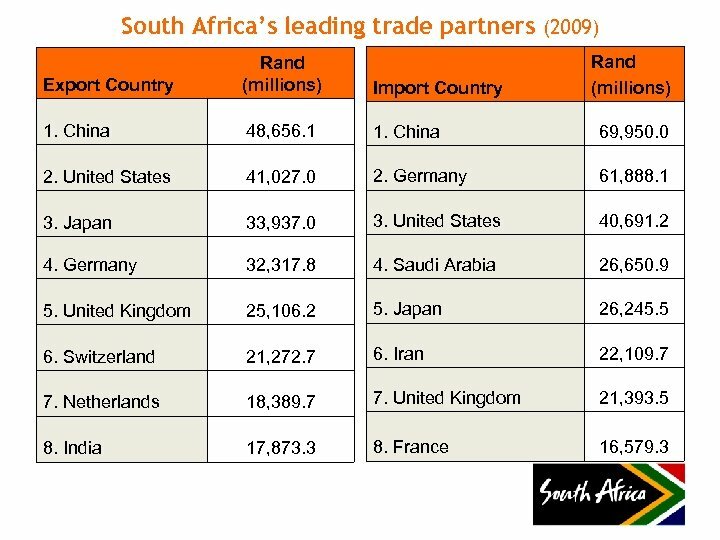 • Main trading partners: Germany, USA, China, Japan & the UK. 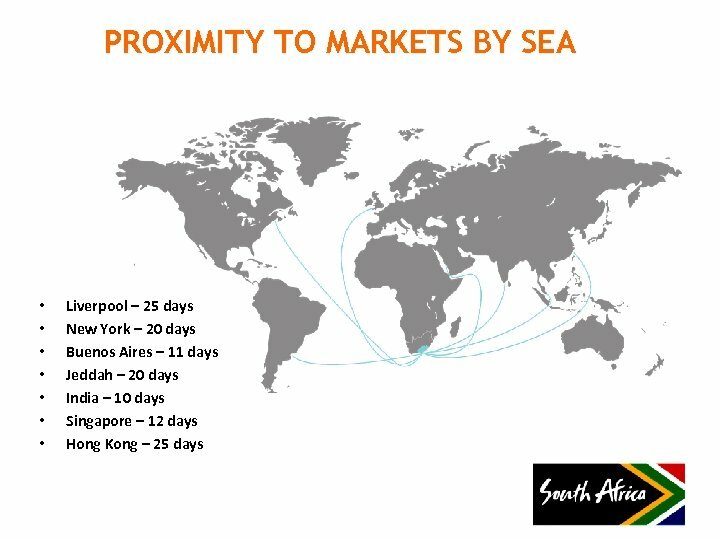 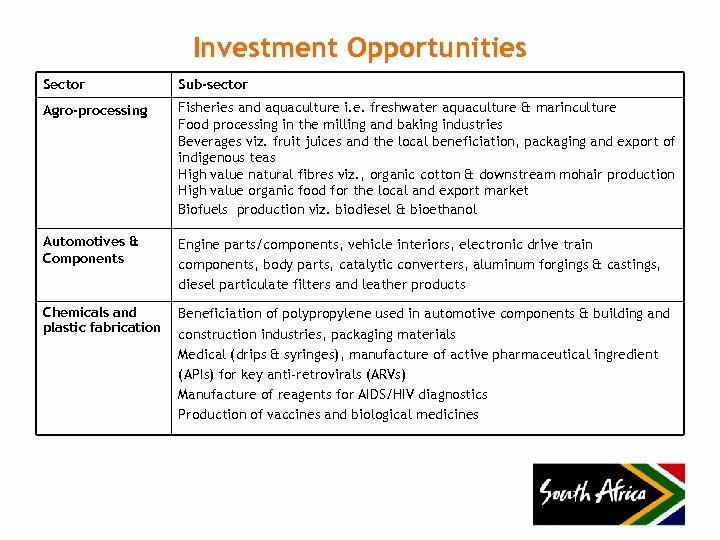 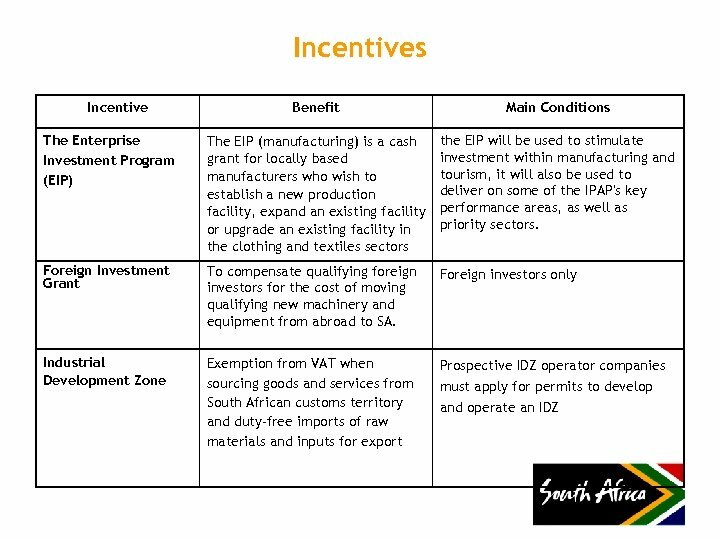 SOUTH AFRICA- GLOBAL PERSPECTIVE • South Africa is one of the most sophisticated and promising emerging markets, offering a unique combination of highly developed first world economic infrastructure with a vibrant emerging market economy. 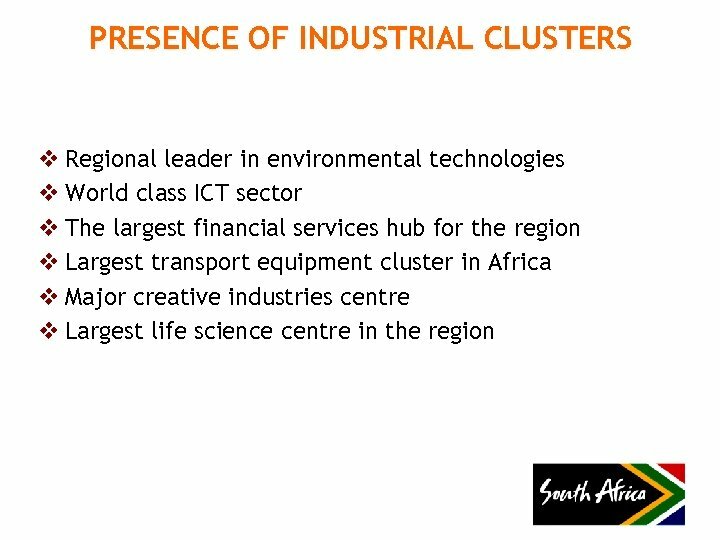 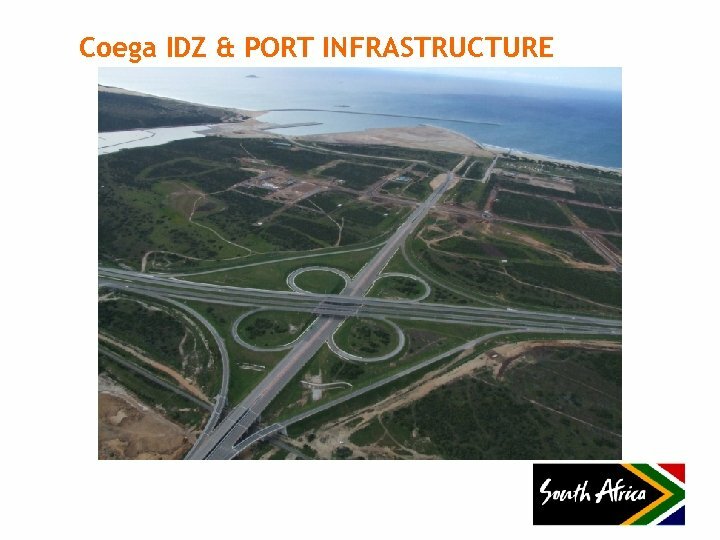 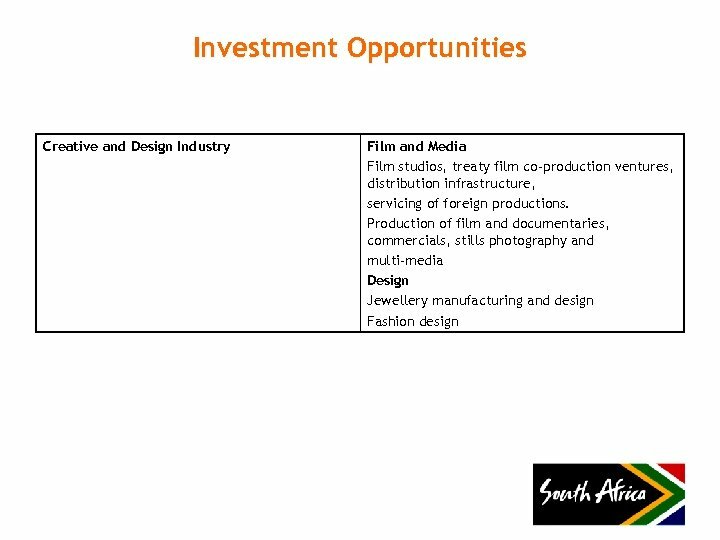 • South Africa is one of the world’s 26 industrialised nations. 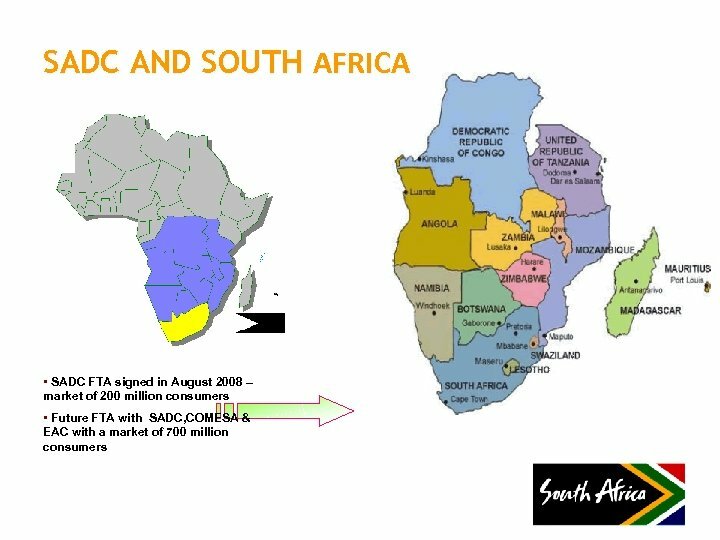 • The country is also regarded as the gateway to Africa. 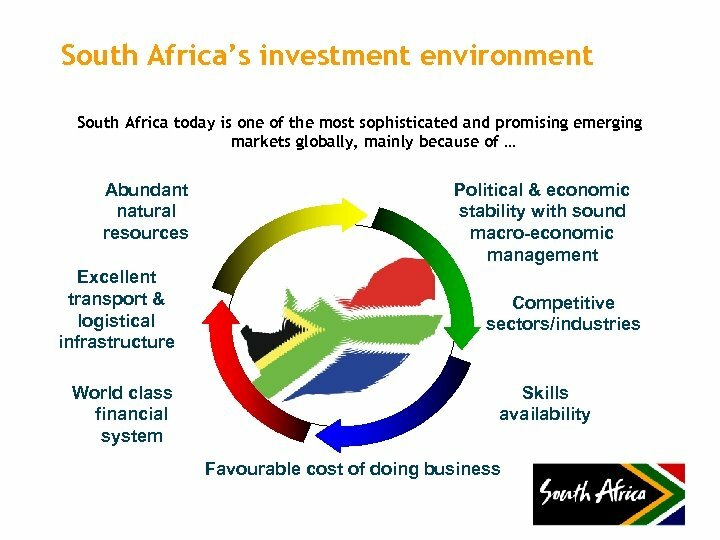 • South Africa has the largest economy on the African continent, accounting for approximately 25% of the continent’s GDP. 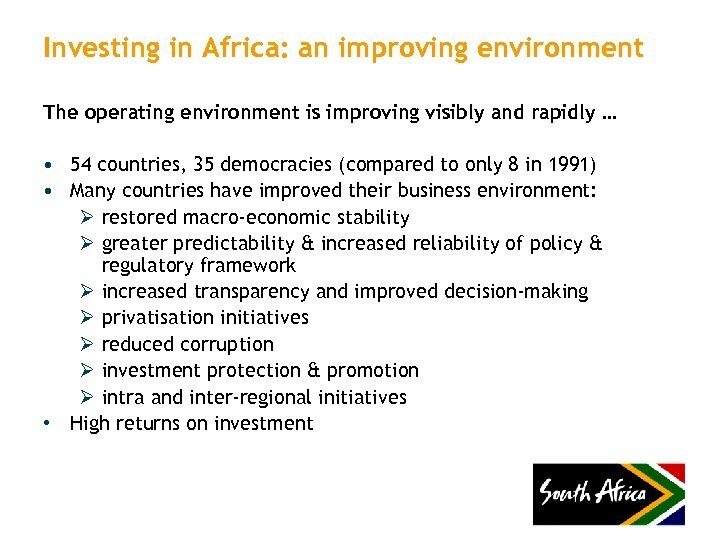 • According to the World Bank, South Africa ranked 34 th out of 183 in the world for the ease of doing business in 2010. 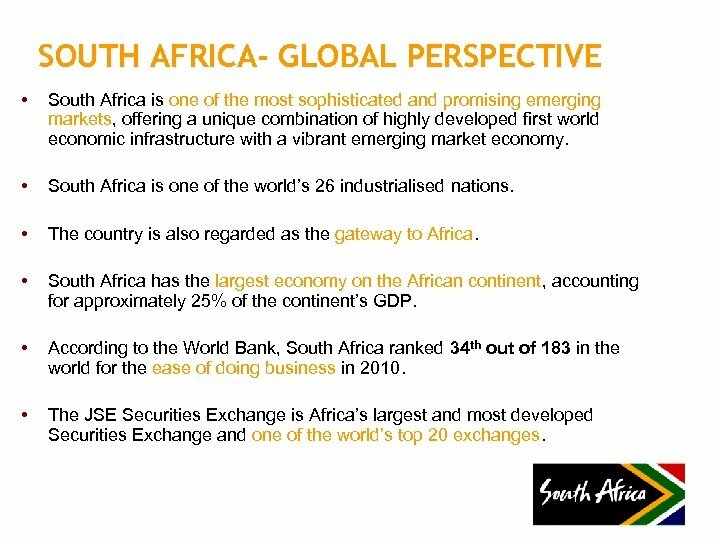 • The JSE Securities Exchange is Africa’s largest and most developed Securities Exchange and one of the world’s top 20 exchanges. 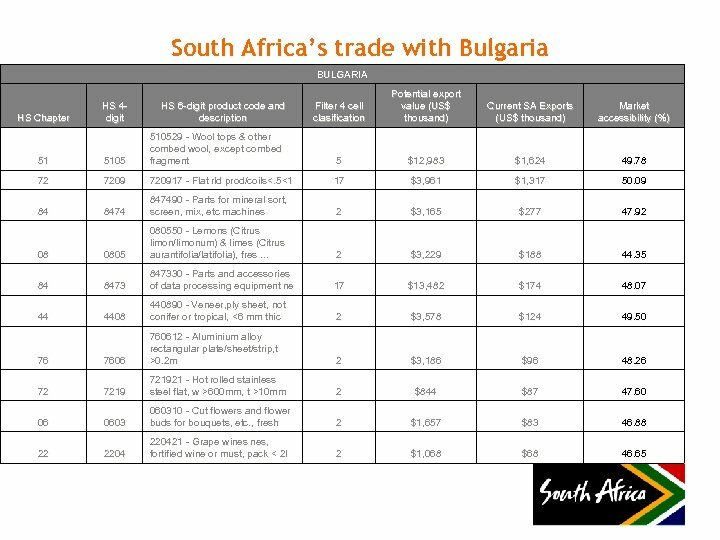 SOUTH AFRICA - GLOBAL PERSPECTIVE • South Africa remains the world’s top producer of minerals such as gold, platinum, rhodium, chrome, manganese and vanadium. 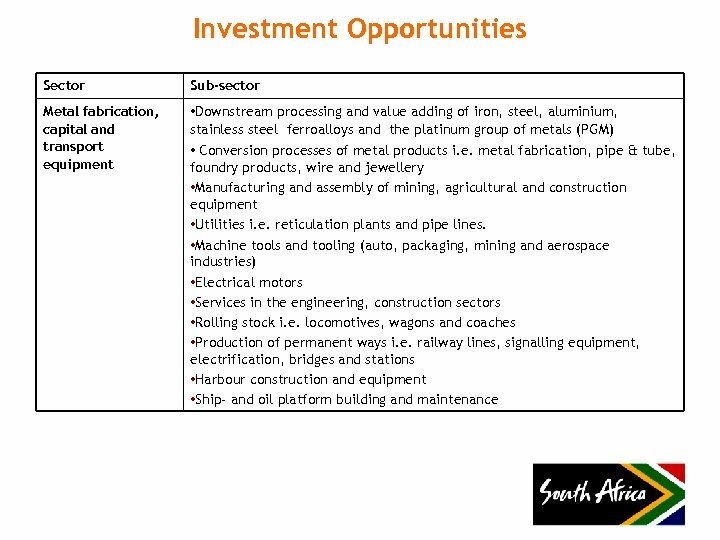 • South Africa holds 80% of global manganese reserves, 72% of chrome, 88% of platinum-group metals (PGMs), 40% of gold and 27% of vanadium. 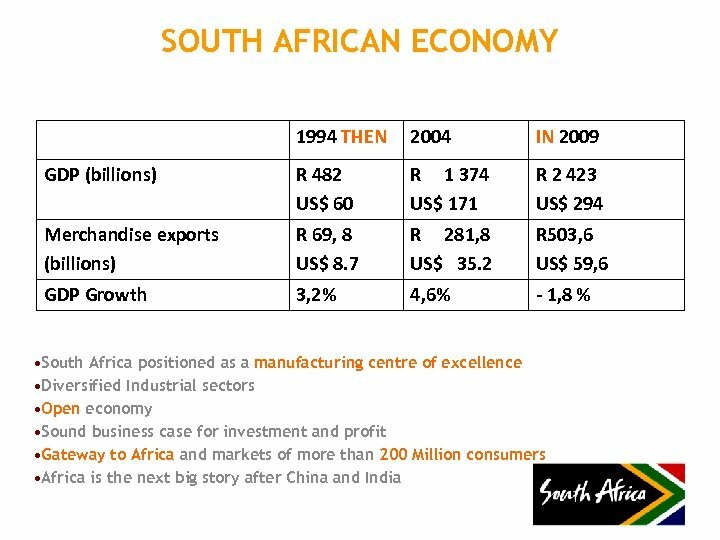 • Unit labour costs in South Africa are significantly lower than those of many other emerging markets. 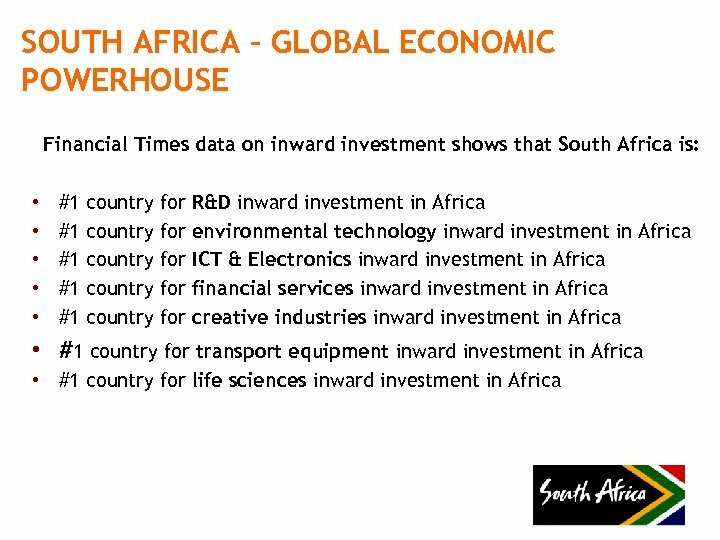 • South Africa scored well in various categories according to the 2009/10 World Competitiveness Yearbook (133 countries ranked) with overall competitiveness we ranked 45 th in place. 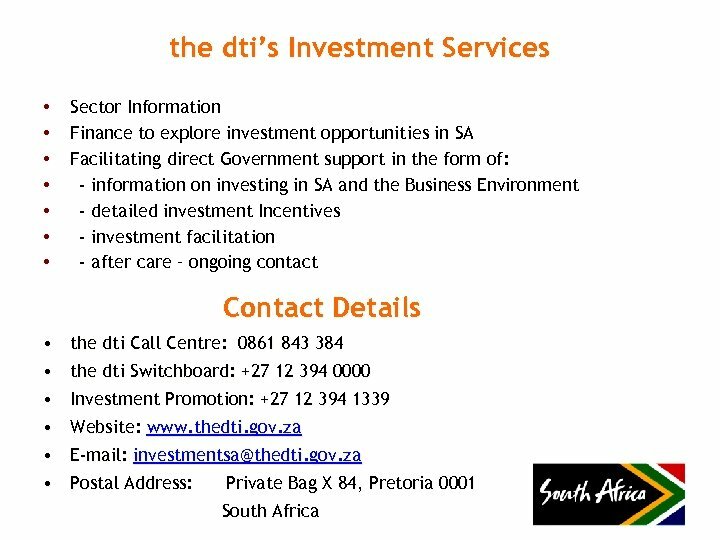 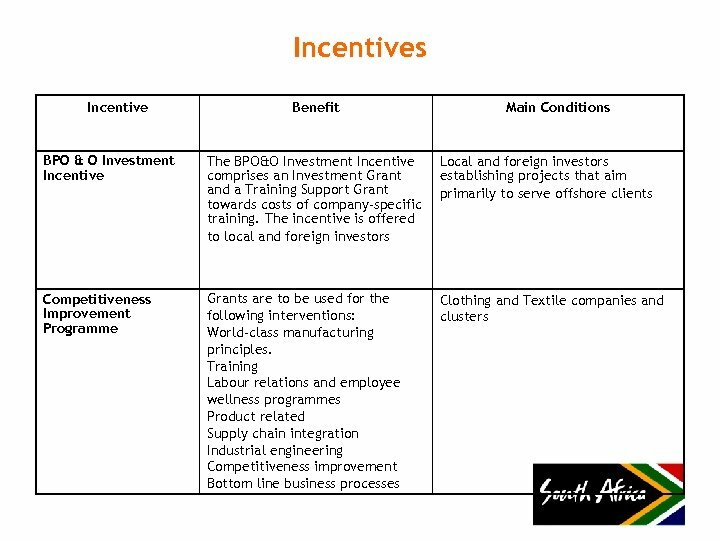 Investment Opportunities Sector Sub-sector Business Process Outsourcing & IT Enabled Services • Call Centres • Back /office Processing • Shared Corporate Services • Enterprise solutions e. g. fleet management and asset management • Legal process outsourcing • Software & mobile applications • Smart metering • Embedded software • Radio frequency identification • Process control , measurement & instrumentation • Security & monitoring solutions • Financial software Electro Technical Clothing, Textiles, Leather and Footwear • Manufacturing of Industrial Textiles using Polyester • Production of other natural fibre textiles such as flax • Wool and mohair production – downstream opportunities for yarns, knitwear and fabric. 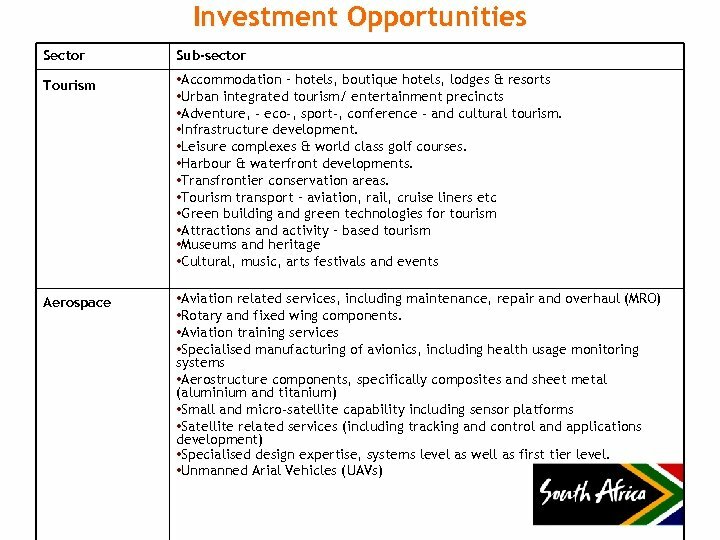 Investment Opportunities Power generation and distribution Independent power generation, energy infrastructure & alternative energy Renewable energy and energy saving industries Solar water heating, evacuated tube plants, concentrated solar heating, wind and biomass energy production Advanced Manufacturing Advanced materials manufacturing viz. 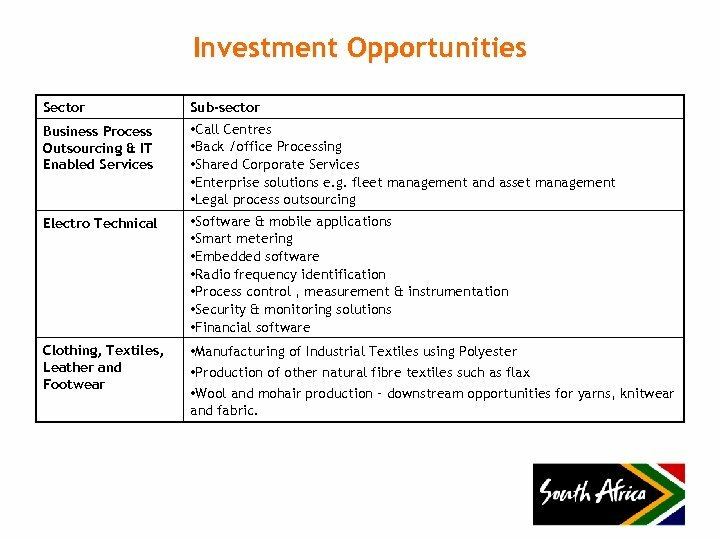 Nano-materials • High performance materials based on natural resources (advanced biocomposites) • Composites (intelligent textiles used in medical, building and construction industries) • Continuous fibre reinforced thermoform composites Digital TV and Set Top Boxes due to migration to full digital television as analogue will be switched-off by November 2011. 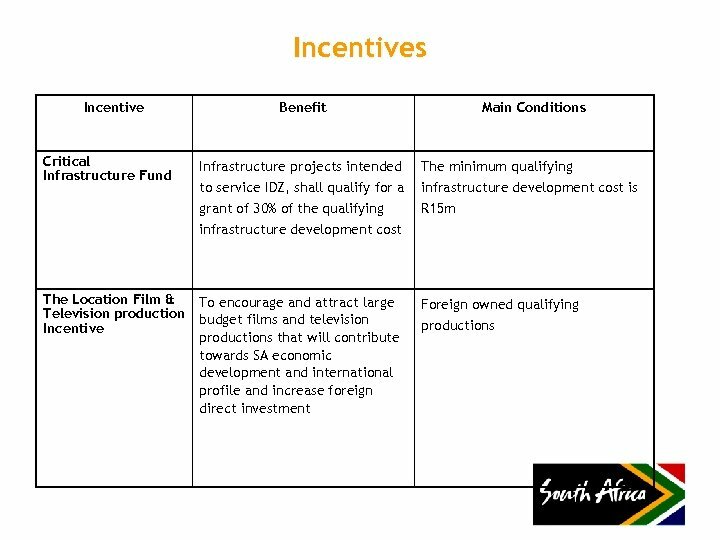 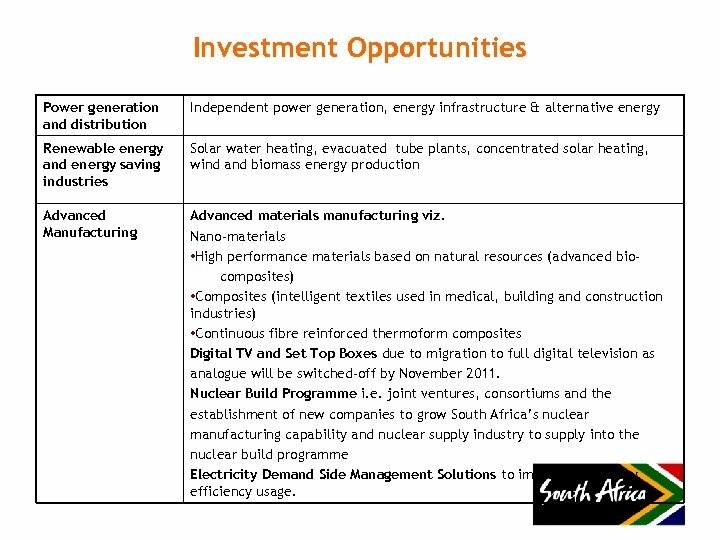 Nuclear Build Programme i. e. joint ventures, consortiums and the establishment of new companies to grow South Africa’s nuclear manufacturing capability and nuclear supply industry to supply into the nuclear build programme Electricity Demand Side Management Solutions to improve electricity efficiency usage.